Animoto - Animoto is a website where you can create videos you can use in the classroom or for a school project. You can also make any type of video you'd like with a convenient interface and a drag and drop system. Animoto makes it easy to make videos. Teachers can apply to use Animoto for free in there class to help educate their students with videos to give learning a fun twist. Dvolver - Make digital movies online with Dvolver. This site is free and helps you create videos with their backgrounds, music, etc. It's nothing too high tech but it is fun for children and adults alike to practice creating animated movies with music, background, words, etc. EDpuzzle - This free video making webpage helps you create videos you can use in your classroom from any ordinary Youtube video. You can cut parts of the Youtube video you want to use and then you use them to create a video for your students or employees to watch and answer questions while doing it. This allows you to check their understanding and give them a grade based on the scores of the questions. FilmoraGo - Free Video Editor! A pretty powerful video editor application, which will not stamp a watermark or place a time limit on your clip. With FilmoraGo, making videos with music and effects is really easy! FilmoraGo helps you make funny videos and relive your memories anywhere. And your amazing video could be easily shared to your friends on Youtube, Instagram, Facebook, WhatsAPP, etc. Kizoa - This site is a movie maker webpage that helps you create movies/videos using your photos, videos, and music. This free site gives you a chance to create slideshows, collages, etc. This site gives you a chance to create videos for free with an easy to use platform. Movavi -Movavi Video Editor is a powerful yet easy-to-use video processing program for Windows. Cut and join video clips with zero quality loss, apply stylish video effects and filters, add music, titles, and much more! Powtoon - This site helps you create videos using animation and fun voice overs. This free video maker can help with business lessons, teacher lessons, and other forms of presentations you might have that you want to have some fun with. Screencast-O-Matic - Create screencast videos with our screen recorder. It’s fast, free and easy to use! Capture your screen, add a webcam and use narration to customize your video. 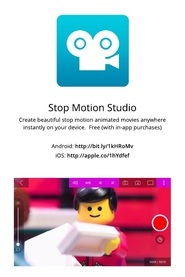 Stop Motion Studio - The world’s easiest app to get you into stop motion movie making today! Want to create movies like Wallace and Gromit or those groovy Lego shorts on YouTube? Then this is the app you’ve got to add to your collection. Stop Motion Studio helps you to create terrific stop action movies with a whole host of unique features! Ted- ED - This site is a video lesson making site much like EDpuzzle. You can create video lessons you can use in your classroom specifically. They also have many lessons already created for teachers to use already. This site helps you create videos using any Youtube video or video you have created yourself. Find out more about Ted-ED on this page here. 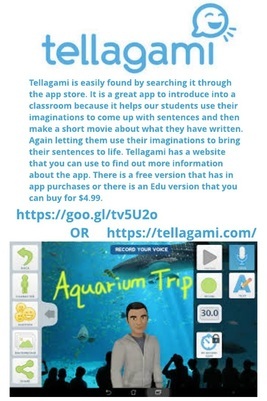 Tellagami® - is a mobile app that lets you create and share a quick animated Gami video. With Tellagami, You can create a scene, add dialogue and share or save your video. Tellagami® is a collection of innovators, technology gurus and creative artists in San Francisco exploring new ways to bring your messages to life. By combining photos, voice, 3D character customization and personality on a mobile platform, we help you communicate in a way that's never been possible. ​Vimeo - In 2004, Vimeo was founded by a group of filmmakers who wanted to share their creative work and personal moments from their lives. As time went on, like minded people discovered Vimeo and helped build a supportive community of individuals with a wide range of passions. Today, millions of people from all around the world enjoy Vimeo, and we’re growing bigger every day. We hope this fun and friendly environment fuels your own creativity and inspires you to contribute to Vimeo in the ways that mean the most to you. WeVideo - is the online video editor that makes it easy to capture, create, view and share your movies at up to 4K resolution for stunning playback anywhere. Video creation for all. Advanced video editing features made easy through a simple interface.